Judging a book by its cover is appropriate for once, because this cover has her own story. Tanned and polished to a chestnut brown, Robert Couper’s book on impregnation is bound in leather of the human variety. Anthropodermic bibliopegy is the practice of binding books in human skin. While now relatively unheard of, human skin-binding after a person’s death was a somewhat common practice centuries ago, and has occurred at least since the early 1500’s. While the practice may seem overly macbre, it was a way for people to memorialize loved ones. Occasionally, the confessions of criminals were bound in the skin of the convicted as well. In the 19th century, it was not that uncommon for surgeons and physicians to tan human skin into leather and have it fashioned into pocket-books and instrument cases. In this case, for then 23-year-old resident J. Stockton Hough, this was not some ghoulish eccentricity, but a unique way to preserve the memory of a patient who unintentionally helped him advance anatomical and medical research. Dr. Hough diagnosed Philadelphia’s first case of trichinosis thanks in part to his patient Mary Lynch, an Irish immigrant who died in the Almshouse at Philadelphia General Hospital in 1869. The only thing that makes this book unusual is that it is partially bound in skin taken from Mary Lynch’s thigh. Inscribed in this book's front flyleaf reads, "The leather with which this book is bound was tanned from the skin of Mary L___ affected with encysted trichinae who died of consumption in the Phila. Hospital, 1869… Mary L___ was an Irish widow aged 28 yrs. -- died Jany. 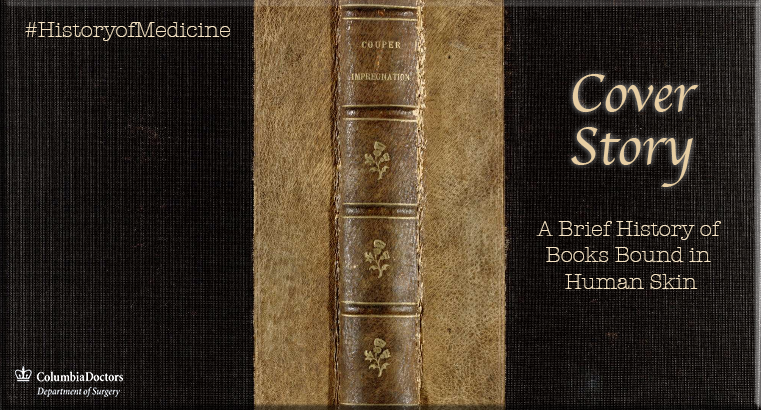 16, 1869…"
You can explore Couper’s Impregnantion in detail here; and see this very book on display at the College of Physicians of Philadelphia’s Mütter Museum.